With the latest (and some say greatest!) installment of the Star Wars movies ready for world wide release in theaters tomorrow, "The Force" has once again been awakened in the Southwest of Ireland. Skellig Michael, an island off Ireland's rugged west coast and host to some of the movie's key scenes, is now ready for its close-up in The Last Jedi. The breathtaking sites where filming took place, including Great Skellig or Skellig Michael, the larger of two entirely uninhabited islands seven miles off the Irish coast are slated to be once again prominently featured in The Last Jedi. (Spoiler alert for the few of you left to have not seen last year's The Force Awakens - the movie’s closing scenes were filmed on Skellig Michael.) When the newly awakened Jedi, Rey, dramatically comes face to face with the Jedi Master, Luke Skywalker, he is perched precariously on the edge of what seems to be the world. The Island is now home to only Puffins and Ganets, but long before Luke Skywalker climbed the 618 steps ascending over 600 feet to its peak, only monks inhabited the Island. A day tour with Killarney Guided Tours on the Ring of Kerry provides photo opportunities with mesmerizing views out to the Island. As our Founder is himself an avid photographer of nature, landscapes and wildlife, professional photographers, or those of you who care to just take a few snaps along the way, will find this tour particularly enjoyable. Skellig Michael is a dream location for both a Star Wars Super-fan or nature photographer alike, and is the centerpiece of this photographic journey. If the weather cooperates, and your stomach can handle what the Atlantic Ocean can often make a less than gentle boat crossing, there’s no time like the present to be one of the few to step foot on the Island and channel your inner Jedi. There’s no need to merely live vicariously through your Star Wars favorites because this privately guided tour allows you to walk in their footsteps and feel the crisp, ocean air for yourself. You can decide whether you want to brave the boat and ascend those narrow steps to the peak, or whether you’d prefer to keep your feet firmly planted on the beautiful Irish mainland for views from a comfortable distance. Staying on the mainland doesn’t mean you miss out, as you’ll be fully rewarded with time enough for a full day tour of the Ring of Kerry. You’ll still have plenty of spectacular photo opportunities looking out comfortably from Portmagee to Skellig Michael. No matter which option you choose, this tour will satisfy both avid and leisure photographers, the Star Wars Super-fan, or simply curious travelers like no other tour. Jutting into the Atlantic Ocean, and home to the most western point in all of Europe, the Ring of Kerry is ranked as one of the Top 50 Drives in the entire world! Killarney Guided Tours expert guides negotiate the winding, narrow roads for you, leaving you to relax and experience the wonderland of forest, blanket bogs, rivers, lakes and sandy beaches along the way. Terrain as varied as Ireland’s highest peak, Carranuntoohil, and as lush as the warm, gulf stream washed lands makes up the Ring of Kerry. This truly magnificent coastal drive, starting and ending in Killarney, is a beloved part of Western Ireland’s Wild Atlantic Way and is best enjoyed with your camera in hand and time to linger along the route. While tour options in Ireland are truly endless and fill many guidebooks, in the hands of an experienced Killarney Guided Tours guides, you’ll understand why this magnificent area offers everything you’ve imagined while planning the Irish tour of your dreams. 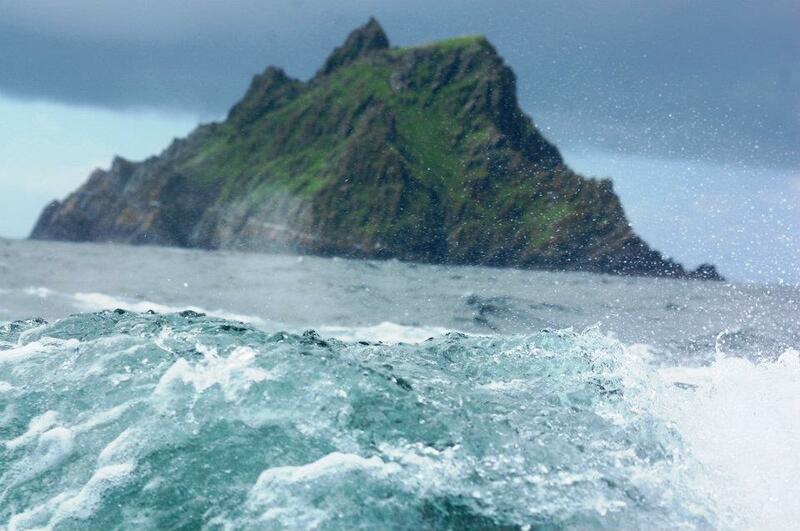 Star Wars fan or not, consider joining us on the Ring of Kerry and experience exactly why Hollywood returns to Ireland’s coastline, rolling hills and green fields, again and again. We have a feeling once you experience the area for yourself, you’ll soon be doing the same thing.